Despite the joy of having a beautiful baby boy or girl to call your own, if you are a single mother of said child, it is a tough situation to be in. Whether the father left you after knocking you up, or if the father split up with you early in the child’s life, you as a single mother may be wondering how you will be able to get through this. First off, it is important to recognize that you are not alone. In fact, approximately 40% of babies are being raised by single mothers. If they all can do it, then so can you. To help reassure you that the growth of your baby will be a successful, we’ve put together some tips and mindsets to always follow while raising your baby. No matter where you are in the process of motherhood, whether it be still pregnant or already with child for years already, you need to make sure to slow things down and focus on one thing at a time. This essentially proves to be the more effective strategy because it keeps you focused on one task, rather than getting overwhelmed by all of the tasks that will follow. If you are still pregnant, just worry about making sure you have a successful birthing process. Once you once you get home from the hospital, focus solely on taking care of your baby. And once you are ready to go back to work, start looking for a job, as well as daycare for your baby. Looking for a job should be delayed until after your baby is born. Thinking about all those responsibilities at the same time will inevitably only give you more stress, more sleepless nights and more difficulty accomplishing your current task at hand. But if you take it step-by-step, you will find that each task is very manageable, and will see that with every step that you get through in the process you will be stronger and more resolved in your effort to give your baby a bright future, regardless of if there is a man in the house. Although your friends and family don’t necessarily need to be right by your side every step of the way, they should at the very least be available to provide you with an emotional safety net. Daily life may become so stressful for single mothers that all they really need is an outlet to release their emotions. Someone to simply tell them that everything will be OK and give them reassurance that they are doing a good job and that it will all pay off in the end. A good recommendation is to not just have a few close friends and family that you have on speed dial when you need to talk, but to make it a point to talk every week, no matter what. Whether or not you realize it, by having a set date and time every week where you just talk about how you are doing whether it is good or bad, your stress levels can go down dramatically, lessening the likelihood of an emotional breakdown cropping up in the first place. This support network also can be used when you absolutely need an extra hand. Whether you suddenly have a last-minute job interview without anyone to watch the baby, or just need a ride to the grocery store while your car is being serviced, anything that your friends and family can do to help means significantly less stress for you. You should always be grateful of such kindness, and whenever possible show them or let them know that you are appreciative of what they do to help you out while raising your child on your own. Having a support network of friends like this is invaluable to single mothers. Another word of warning, although your friends and family may seemingly have all the time in the world available to help you out, don’t become dependent on them. Not only may this end ruining your overall relationship either now or down the road, it can also have a psychological effect of diminishing how you perceive your role was in taking care of your baby. You don’t want to feel like you didn’t work as hard as you could of to raise your child, so make it a point to do as much of it as you can on your own, only relying on your friends and family from time to time, or when you really need their help. Unfortunately, while society has changed much over the years, there will still be quite a few people who look down on you once they find that you are a single mother. The best piece of advice that we can give is to simply ignore them. Even if you’ve known certain people for years, there is nothing wrong with distancing yourself from such people if they no longer treat you with the respect and compassion that you deserve. Instead, surround yourself with people who support and understand your situation. Not only will this decrease stress levels, but it will also lead to a widened support network that will make raising your child even easier. Although this isn’t a hard requirement, many women end up feeling like their child needs a strong male role model in their life as they grow up, especially if the child is a boy. And while this is a perfectly reasonable sentiment to have, many women feel like it cannot be accomplished as a single mother. But don’t forget that male role models can exist in many different forms. Family members like your dad or brother can become people that your child looks up to, as can close male friends. Even teachers, coaches and neighbors can be role models for your child. All you need to do is expose your child to positive uplifting people with good values and any one of them may end up being a role model for him – possibly more than one! 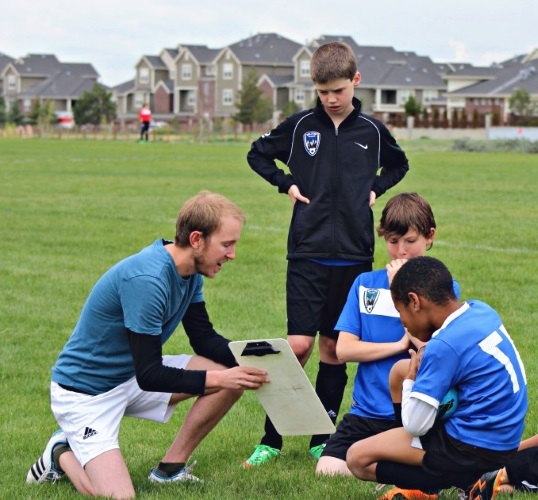 Your child’s youth soccer coach can potentially be a great male role model for them. At the same time however, don’t forget that you on your own will always be a huge role model for your child, especially because you raised them al on your own. Always be sure to embrace that fact, even if there does end up being other role models (male or female) in your child’s life. Single Mothers Can Thrive and Succeed on their own! The fact of the matter is that day-to-day responsibilities for a single mother are the same as those for mothers who are still with their partner. And while this does mean that raising a child on your own can be more difficult, you will still be able to give your child the bright future he or she deserves! In fact, perhaps the greatest benefit of being a single mother is that you end up being a much bigger influence on them compared to if you raised him or her with a partner. So be sure to follow the above tips, never give up and just watch yourself succeed in the ultimate test known as motherhood. Good luck!